Shopping for kitchen appliances and cookware never ends. Why not purchase these kitchen necessities in bundles and make your life easier? There are plenty of cookware sets of great technology at a great price for sale today. The list below is all you need to read to learn about the best collection of the best cookware sets. Let’s dive in. Comes in 15 pieces, this nonstick ceramic cookware set surely reduces your effort and time for shopping and cooking. The cookware set has a soft touch and riveted handles for secure, handy grip. Made of heavy gauge aluminum with ceramic coating, this set is stain/scratch resistant and durable. Its cooking surface has the ability to reach 700 degrees Fahrenheit, and bare 250 degrees Fahrenheit of oven heating. This nonstick cookware set from T-fal is another outstanding bundled kitchen purchase that we recommend. The set of 12 cookware pieces has a unique thermo-spot heat indicator for proper preheating and riveted silicone handles for safety and comfort. If your food requires cooking in the oven to finish, the cookware is oven safe up to 400 degrees Fahrenheit. Ranked in one of the best cookware sets, this cookware set is made of clad metal, aluminum and stainless steel riveted handles that stay cooler with airflow technology. The lids of this cookware set allow you to see your food while cooking. 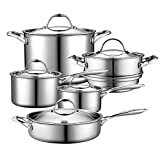 The cookware set is known to be a heavy-duty set with no coatings, avoiding scratch at all times. If you do not need as many as 12 or 15 pieces of cookware set, this 10-piece cookware set is for you. Simply Calphalon nonstick cookware set is constructed from hard-anodized aluminum, providing brilliant conductivity and evenly distributed heating. And, hard-anodized cookware is completely non-stick and chemical-free. Even though the tempered glass cover of this one is not dishwasher-safe, everything else is. 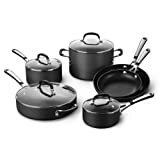 For this 15-piece set from Cook N Home, the cookware set is also recognized for the nonstick performance, soft touch handles, and heavy gauge aluminum construction. Besides, it is also complemented for price and versatility. This is totally not a disappointing investment because the purchase also comes with a number of useful utensils. If your cookware set shopping is on a budget of under $100, you should consider this bundle from T-fal. 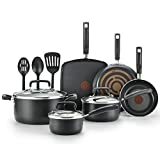 Similar to other cookware sets from T-fal, this 12-piece set is constructed of heavy-gauge aluminum and equipped with the unique thermo-spot indicator. These features promote even heating and proper pre-heating respectively. Its nonstick performance makes cleaning/dishwashing very easy, and it uses less oil as well. If you are into colored cookware, you should keep your eyes on this adorable bundle for Gotham Steel. This set comes in only 7 pieces, but, sometimes, less is more, right? This ceramic cookware set lets you use metal utensils and dishwashing freely without worrying about having a scratch on it. And, all of the pieces do come with the Gotham Steel lifetime guarantee. Once again, a cookware set that has received so much love. Being lightweight and ultra non-stick, all leftover residues from cooking slides off the pan easily. Undoubtedly, the cookware is also dishwasher safe, microwave safe, and oven safe up to 500 degrees. However, you should beware that these 10 pieces of cookware are not compatible with induction. Getting very near to the end of the list, we want to present to you this best stainless steel cookware set from a new brand, All-Clad. The set appears to be expensive, but its benefits really outweigh the price factor of this product. 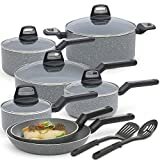 Surpassed many customers’ expectation, this 10-piece nonstick cookware set has a highly polished cooking surface, making it very easy to maintain. Last but not least, we cannot forget Black+Decker when it comes to kitchen equipment. The Black+Decker titanium nonstick cookware set is aluminum-made and titanium-reinforced for durability and superb cooking results. At the same, its handle is ergonomic and heat resistant, so you will never burn your thumb when cooking again. We like to invest in quality cookware sets because it can save us some money from dining in restaurants as our cookware can already cook any food into perfection. Plus, homemade food tends to be healthier than restaurant food as well. On a side note, it is highly recommended that you read the instructions for care, cooking and cleaning of these cookware sets before using. Ignite your cooking spirit with one of these goodies today!